The Duncan family, Andy, Jane and Rene, lived in the cemetery lodge, a long, cream weatherboard house with 3 bedrooms, dining room, kitchen and long corridor. A large, old pine tree dominated the front yard, giving welcome shade in the hot summer, but making the house dark and cold the rest of the year. Probably behind the house Andy set up long clotheslines where Jane could dry the hospital laundry. Jane was soon active in town life, baking and serving tea at fundraisers and working bees (volunteer work parties). At the September 1926 Christ Church Jumble Fair the refreshments stall was run by Mesdames Gane and Duncan (The Gane ladies also worked as laundresses at the hospital. Jane would have known them quite well). In October there was a working bee at the Amherst cemetery. Jane no doubt organised the group of ladies who provided afternoon tea. At the April 1927 harvest thanksgiving the church bazaar tea rooms were in charge of Mesdames Duncan, McAlpine, and Miss Philippi. Andy and Jane were regulars at local euchre tournaments, both winning prizes quite often. (Euchre is a trick-taking card game most commonly played with four people in two partnerships. Tournaments such as these were common between the wars in Australia, and were held as social events and fund-raising activities). Andy’s work at the cemetery continued to be irregular and insufficient. In April 1927 Andy reported to the Cemetery Trust that he had not been able to get payment from several families for maintenance work on the graves. The Trust advised that it had no power to pursue payment. Unemployment in Australia was rising and some families were already finding it tough to pay their bills. The local newspaper commented on the depression that is existing all over and noted that although local employment prospects were quite good, in other towns the unemployment question is very acute. In July 1927 Andy joined the town in the annual wood-chop working bee to provide wood for the Amherst Hospital. This was a major tree-felling operation. A working bee organised for the cemetery in October 1927 was less well-attended. Nonetheless the ‘Talbot Leader’ reported that Mr Duncan has considerably improved the appearance of the cemetery of late. Andy had rebuilt and reinforced the fence to stop the rabbits getting in, and repaired graves damaged by rabbits burrowing and heavy rain. 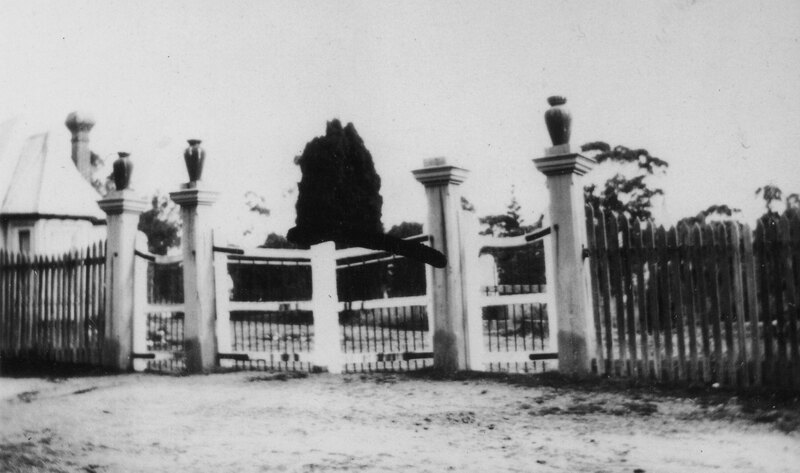 Amherst Cemetery gates, with the fence that Andy repaired in 1927. The Sexton’s cottage is on the left. Reproduced courtesy of the Talbot Arts & Historical Museum Inc. In mid-1931 Andy supplemented his Sexton’s income with an appointment as Registrar of Births and Deaths at Talbot. With clerical experience in the British army and the A.I.F. Andy had already sought a position as Secretary of the Cemetery Trust, but the trustees had felt it inadvisable for Andy to hold both Sexton and Secretary positions. Now, with the sudden removal from office of the previous Registrar, Andy was an obvious choice for the position. Then just four months later Andy resigned as Registrar of Births and Deaths and left the Sexton’s cottage without formal notice. What could have caused this sudden departure? As Andy neared 50 perhaps his shrapnel injury made it increasingly difficult for him to continue labouring work – was it worth it, when the work was intermittent and he had to chase families for payment?Perhaps Jane’s elderly parents in Beaufort needed support (Jane’s mother was 73 and not in the best of health; her father was 87). Perhaps the beginning of the Great Depression and the announced closure of the Amherst Sanatorium made Andy and Jane reconsider their options. Whatever the reason, in 1932 Andy, Jane and Rene were back living at the Stewart residence in Beaufort. Victoria Government Gazette No. 183. 19 August 1931. Page 2288. Victoria Government Gazette. No. 291. 23 December 1931. Page 3489. Featured image: Sexton’s cottage, Amherst Cemetery. Reproduced courtesy of the Talbot Arts & Historical Museum Inc.
‘Working bee’ – a volunteer work party, often organised by community groups to complete cleaning or maintenance. ‘Euchre tournament’ – euchre is a trick-taking card game most commonly played with four people in two partnership. Euchre tournaments were often held in Australia between the wars as social events and fund-raising activities. I love the old style architecture, the interesting roofs, the tall chimneys. It would be great to see that house restored to its former glory. And the mystery of his leaving Amherst in the Depression years. So interesting. As is the need to explain some of our Australian expressions for overseas readers. Thanks for commenting. Sadly the sexton’s cottage was damaged in the 1985 bushfires that devastated the area. The cottage was later demolished. In its last years it must have looked quite spooky, empty and dark in the cemetery grounds on a country road. Imagine what the local children thought of it. That would be a fitting story for a spooky house at the cemetery. Hi Kerry, Thanks for visiting my blog. I’m afraid I don’t have any more information on the cemetery – what I have posted was gathered from family stories, the Riponshire Advocate newspaper, and the Talbot Arts and Historical Museum. The people at the Museum are very friendly and helpful, so if you haven’t visited them, perhaps you should.